Larry Orlando has a knack for leaving an indelible impression. In fact, it’s fair to say the calligrapher and retired math teacher has mastered the art. “Mr. O is the reason I am a teacher,” said Sean Kenney, a Geibel Catholic Jr/Sr High School 1987 alumnus. Dr. Justin Frantz, ’92, a physics professor at Ohio University agrees. He commented, “Everyone loved his class, even people that weren’t necessarily doing so well. As an educator now, I’ve realized just how hard that really is. Known as Mr. O by the more than 3,000 students he had during his forty-two year career at the small Catholic high school, Larry taught more than algebra, calculus, trigonometry, physics, and geometry. Sean commented, “He built a classroom culture that is unsurpassed. Mr. O wore bow ties, sang, danced, and showed how life can be great if you just try to be yourself. 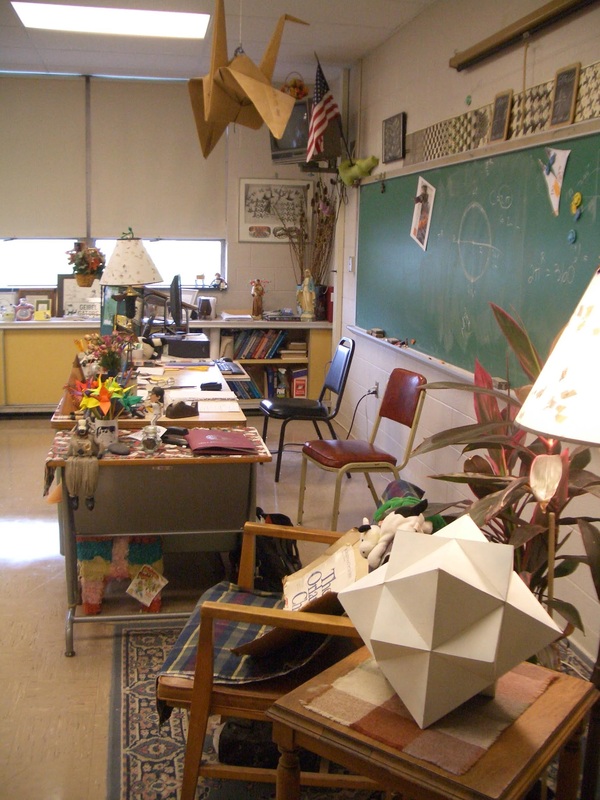 They included his hand-made origami crane hanging from the ceiling and paper polyhedral model resting on a cloth-covered stand, math-based puzzles placed all around the room, readings of James Joyce, a New Yorker magazine displayed and all things interesting in-between. “All these things made his classroom a place that you just associated with “fun” and you just liked being there. So in my classes in physics I always try to add some of these kinds of “digressions” to keep it interesting,” said Justin. Larry likes the description of his room as a “Playground for the Mind” offered by fellow Geibel teacher Justin Stevenson. This whimsical learning environment may not have happened if it were not for a Christmas gift Larry received from his wife, Marge, in 1974 when his career was just getting underway. It was a book on how to write calligraphy. But it became so much more. Larry explained, “I used the book to teach myself calligraphy and liked it so much, I wanted to learn more so I sought out the best teacher I could find. I found out it was Arnold Bank, a NYC artist who was teaching calligraphy at Carnegie Mellon University and took his class. She explained, “One day in physics class we were doing scaling figures. Mr. O pretended he was a store clerk at a home improvement store. He posed the question to the class, ‘If you wanted to double the area of your garden, by what factor would you change the linear dimensions? We were the customers and had to come up with material amounts for fencing based on our calculations. Mr O approached a classmate who had not yet come up with his response and asked, ‘Can I help you?’ The student paused and looking calmly up at him stated, ‘No thanks, I’m just looking!’ The classroom erupted with laughter. After serving as a math teacher for two decades, Colleen had the honor of taking over Larry’s class when he retired four years ago. She has since returned to public education, where most of her career had been spent, and is now teaching at the Adelphoi Robert Ketterer Charter School, an alternative school in Latrobe, Pennsylvania. The interest Paul Ruggieri, ’83, discovered while sitting in Larry’s homeroom class also became life-changing. It was Larry’s guidance that opened up a new world of possibilities for Susan Reilly Landahl, ‘78, a nuclear engineer and senior executive at Exelon Corporation. And this encouragement wasn’t limited to the school day. Larry supported and moved students forward by, among other things, instituting the high school’s very first musical production, attending student events, and offering a calligraphy class to students. Susan was one of his calligraphy students. “There were only a few of us the first time he taught it, and we’d meet Mondays after school. Then when the other kids saw how cool it was there were dozens who wanted to get into the next session.” She still uses those skills today. At home, Larry traded his chalk for a pen working as a freelance calligrapher. And he continued learning from accomplished artists around the country. 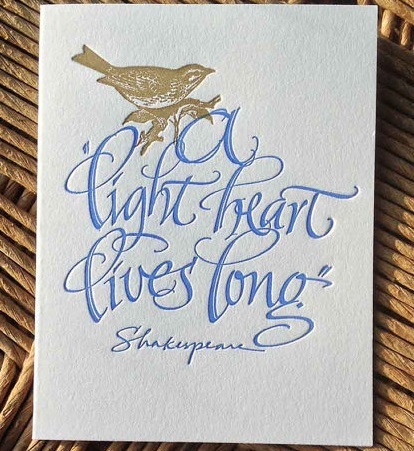 In the past forty one years, he has produced hundreds of expressive calligraphic inscriptions for individuals and clients, including American Greetings, Gibson Greetings, Printery House, Abbey Press and Paper Magic. His creations can be found on Etsy.com at LarryOrlandoDesign. They include signature special occasion Roundels, as well as Letterpressed, 3D, hand-cut, Pop up, and other specialty cards. He also writes many addressed wedding envelopes and wedding invitations. 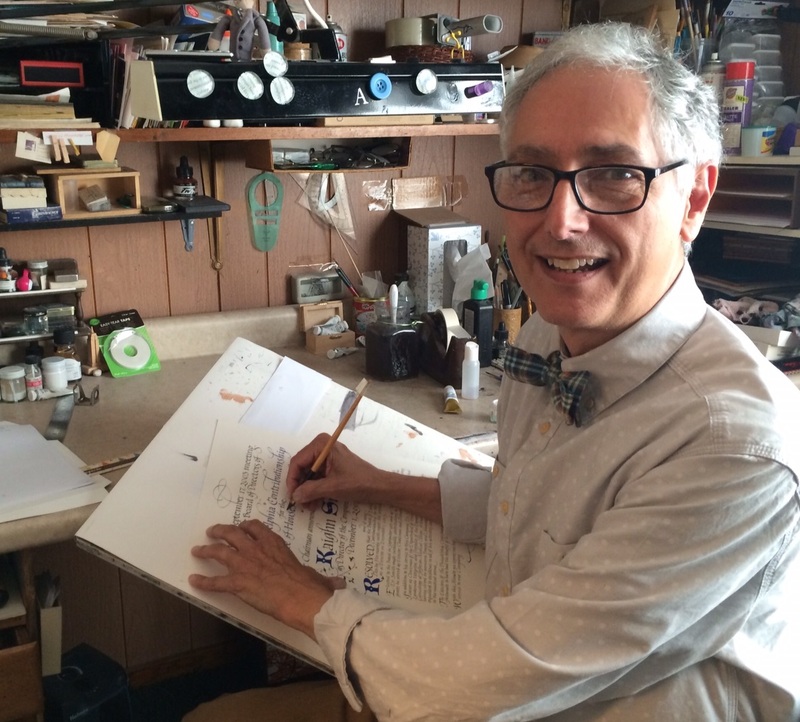 How did Larry master both calligraphy and a teaching career? You might say both are equal to the sum of their parts. This perfect balance has given Larry a passion and purpose that has touched an immeasurable number of lives. Justin remarked, “The most important legacy he left me personally with was that only developing my mathematical skills wasn’t good enough. It was also important to develop more diverse intellectual and artistic skills. Yes, it’s fair to say that Larry Orlando has mastered the art.